Estratto: The Zeugma site was identified in the 1970. It is the name given to two cities, Apamea and Seleucia, on opposite banks of the Euphrates River in southern Anatolia. Zeugma was in the area of a major regional hydroelectric project involving the construction of various dams. One of these submerged 30 of the surface of the ancient site during the summer of 2000. Over 800 m2 of ancient mosaics were removed from the Zeugma site before it was flooded under an artificial lake. The technical treatment used in reapplying the mosaics is discussed. The documentation and verification of the adherence of the tesserae to the temporary support was carried out as part of the study. The preparatory layers were completely or partially removed from the reverse side of the tesserae. The surfaces of the mosaics were also cleaned and the mortar fill between the tesserae was replaced. The surfaces were protected using Paraloid B72 at 1.5 solution in acetone. Cassio Antonio ; Nardi Roberto . — III conferencia general del comite internacional para la conservacion de mosaicos, Soria. Estratto: The state of conservation of the mosaics necessitated the separation of the nucleus from its original support. The transfer and the application of the new support are described. Photographs. 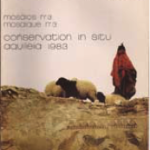 Estratto : I problemi della conservazione in situ dei mosaici pavimentali, anche se numerosi, possono essere ridotti a tre fattori principali: Cedimento dello strato di allettamento delle tessere(sia nel piano che nella coesione); Interscambio con gli agenti atmosferici; Attacchi biologici con particolare riferimento alle erbe infestanti. A tutto questo abbiamo creduto di far fronte con il semplice restauro dei pavimenti mediante il distacco in piccole sezioni, con una altrettanto semplice manutenzione e con adeguate misure di prevenzione contro la crescita di erbe infestanti. Se poi possiamo dare valore sufficiente a una sperimentazione di 24 anni, quanti ne sono trascorsi dal primo intervento di questo tipo, allora possiamo dire di aver conservato mosaici in sito. 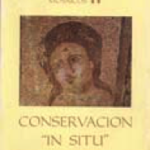 Estratto: The traditional technique of mosaic transfer for restoration, the use of slab cement concrete and of iron rods is criticized as inadequate for good conservation of the mosaic. A new technique developed by the author is described: a gauze is glued to the tesserae, then the mosaic is cut in pieces (maximum 40-45 square cm) and thus is easily transportable and ready to be placed on a new support or replaced in situ. In the latter case, the mosaic is put on a fixed floor of lime mortar, then the gauze is removed and the tesserae can be cleaned. Numerous illustrations show the process. 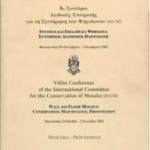 Abstract: The mosaics from pompei and the campanian region – which were detached in the 18th and 19th centuries and then paved the floors of the naples museum – had to be lifted once again to permit the consolidation of the underlying floors damaged by earthquakes. This has allowed the study of the technique used of applying mosaics onto piperno. It seems that the pavement was laid using colophane while the slab was being kept warm. Abstract: In the “puzzle method” of detaching mosaics from their original settings, the mosaics are cut into pieces about 40 x 40 centimeters in size and weighing three to six kilograms. This facilitates both the removal of the mosaics and the transfer to a new support. This method has been successfully used for 25 years. 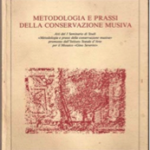 Abstract: Examination of four roman mosaic pavements: description of the decorations and of the conservation state. Proposals for restoration: survey, cleaning, consolidation detachment. List of materials and equipment necessary for the proposed works.